Own a Piece of Playing Card History! The Vicksburg Foundation for Historic Preservation’s first in a series of playing cards sporting images of historic Vicksburg structures hit the market in 2008. 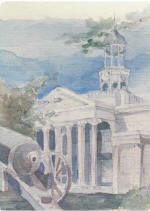 Now the same set of cards is available with a different back (Old Court House) at the request of Bridge players! 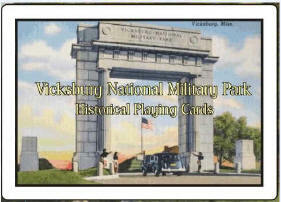 Latest in the series of playing cards is a deck comprised of scenes from the Vicksburg National Military Park captured from historic postcards of the Park and rendered in beautiful color. Each deck consists of 52 playing cards and jokers. Playing cards are available by emailing the Foundation at vburgfoundation@aol.com in downtown historic Vicksburg at the of the Biedenharn Coca-Cola Museum gift shop and at Paper Plus, 1318 Washington Street. We hope that you will patronize these business as they have supported the Foundation.